Chill Time: Until ready to serve. 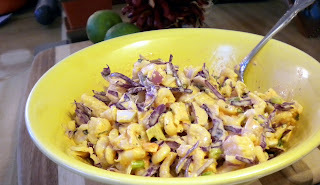 Zo and I were really unsure of what to call this, Shrimp Slaw, Frank Slaw, Zo Slaw, Shrimp Cole Slaw, it is really just hard to say exactly what it is! Other than to say it is really amazing! It was great as a side salad which is what it was originally meant to be but it was even better with tortilla chips as a dip! Either way it is a little tingly on the spice-o-meter so beware but enjoy! Toss all ingredients together in a medium mixing bowl until even. Cover and chill until read to serve!